New for November 2018: we have a separate page on the differences between Chebychev, Bessel, Butterworth, Gaussian and Elliptical filter responses. This page has a short video and links to design tools. New for September 2016: we have a video explaining an exact synthesis technique from Keysight. A note from the Unknown Editor: many textbooks have been devoted to filter design. A classic in this area is "Microwave Filters, Impedance-Matching Networks, and Coupling Structures" by Mattaei, Young, and Jones available free from our download area. Or you can by it for $114 on Amazon. We aren't trying to duplicate all this knowledge here; our goal is, as always, to provide you with a basic understanding of the subject and hook you up with some vendors that can help you out. For the near future we will concentrate mostly on planar band-pass filters, then follow up with some lumped element examples. Will include: topologies, design considerations, tolerance effects, cover effects for microstrip filters, design equations, detailed design procedure, and references. Waveguide filters - how about someone out there contribute on this topic for us? Filters are typically two port networks. They rely on impedance mismatching to reject RF energy. Where does all the energy go? That's up to you as a designer to figure out, and a big reason why filters are typically located between attenuators or isolators. Our page on transmission line loss will explain the difference between attenuation and rejection. Filters that are matched outside of their stop band are called "absorptive filters". One way to make a reflective filter into an absorptive filter is to add an isolator to the filter's input. Another way to do this is to use a diplexer and terminate the unwanted band. Here's a page on a new class of reflectionless filters. This is a filter that passes lower frequencies down to DC, and rejects higher frequencies. A series inductor or shunt capacitor or combination of the two is a simple low-pass filter. Yes we will add some figures here soon!!! The opposite of a low pass filter, an HPF passes higher frequencies and rejects lower ones. A series capacitor or shunt inductor or combination of the two is a simple high-pass filter. A band-pass filter has filter skirts both above and below the band. It can be formed by cascading a LPF and HPF, or using resonant structures such as a quarter-wave coupled lines. A multiplexer is a network that separates signals from a common port to other ports, sorted according to their frequency. Check out our multiplexer page for more info. 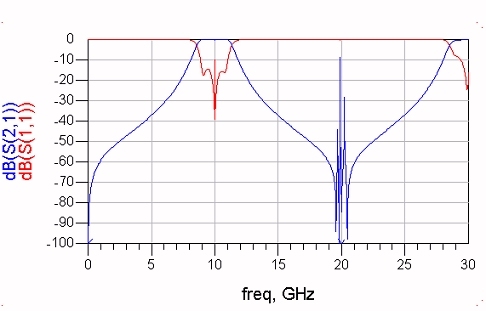 Sometimes when you design a band-pass filter for 10 GHz, it also passes RF at 20 GHz or 30 GHz or 40 GHz. These are called reentrant modes. Below is an example of an coupled-line filter. It uses quarter-wave sections as couplers, they couple similarly at their 3/4 wave, 5/4 wave, etc. frequencies. These are the third, fifth etc. harmonic frequencies. In the figure you can see the passband at 10 GHz, and the reentrant mode at 30 GHz (3/4 wave frequency). Often band-pass filters are followed by a low-order low-pass filter to dispose of the reentrant modes. Resonance is a term used to describe the property whereby a network presents a maximum or minimum impedance at a particular frequency, for example, an open circuit or a short circuit. To learn more about this important concept in microwaves, especially in filter theory , see our page on Resonances of RLC circuits. Sure, these look like very simple designs. But nothing is ever as easy as it seems in microwaves! An RF choke is what engineers call something that doesn't pass an RF signal, but allows a DC or low frequency signal to pass through. Series inductors are often used as RF chokes, as well as quarter-wave structures like the one shown below. Here a capacitor forms an RF short circuit, which is transformed to an open circuit at the input. Such a capacitor is called a "bypass capacitor". A high-value resistor can also be used to form an effective choke. If the resistance is high compared to your transmission line's characteristic impedance, it chokes off the RF. This is used to add a DC ground to an RF line. For example, in a PIN diode switch, you need a path for a series diode's current to return to. A DC block is nothing more than a capacitor that has low series reactance at the RF frequency, and allows you to separate DC voltages along a transmission line. A parallel coupled line can also serve as a DC block. EMI stands for "electromagnetic interference", but you'd already know that if you studied our Acronym Dictionary. EMI filters are used to keep stray signals from polluting your design. Commonly known as "feedthroughs", the basic EMI filter is a low-pass filter, and uses a combination of shunt capacitance and series inductance to prevent EM signals from entering your housing our enclosure. Designing a Chebyshev filter? Check out the instruction page for our our free download for designing three, four and five-pole Chebyshev filters! Our friends over at Keysight Technologies provided a new video on YouTube, describing the Direct or Exact Synthesis approach, where you START with the filter response you want, and then extract the topology. Check it out!